Are there certain dishes that remind you of someone special? For me, bread pudding reminds me of my Mom. Potato salad reminds me of my Aunt Tiita. Thai Mangoes with Sticky Rice will always remind me of a special woman who changed my life this summer. She was an adventurous spirit, a traveler who lived in Thailand for part of her life. She was intelligent, calm, and brave, all of the characteristics I would like to pass on to my children some day. We ate this Thai dessert while we talked about life. The rice was warm, the mango was cool and sweet, just like the conversation. So here it is, my tribute to the mighty mango and to the special women that unknowingly touch our lives. 1. Prepare rice as indicated on the bag. 2. Place coconut cream or milk in a medium saucepan. Add sugar and salt. Bring to a boil over medium-high heat and cook, stirring, until sugar dissolves, about 1 minute. Pour over rice, mix well, then set aside until liquid has been absorbed, about 30 minutes. 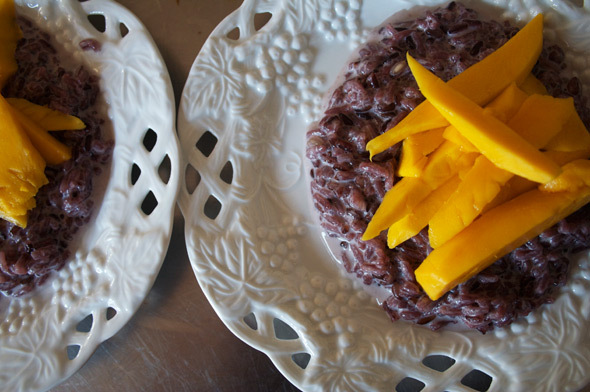 To serve, spoon rice onto 6 plates and garnish with mangoes.